Llull, T.; Mujal-Colilles, A.; Castells, M.; Gironella, X.; Martinez, F. J.; Martin, A.; Sanchez-arcilla, A. The present contribution aims to implement a new methodology to prevent Roll on-Roll off vessels (RO-RO) from causing severe scouring actions. The methodology combines field, experimental, theoretical and numerical tools exchanging information to establish the manoeuvre potential scouring damage. The main contribution is the introduction of a manoeuvre ship simulator to obtain variables that otherwise cannot be obtained in field studies. The se variables, all related to ship’s propeller behaviour, are the rotational speed, the pitch ratio and the engine powerduring the whole manoeuvre. Results show an over- prediction of the theoretical and experimental axial velocity and maximum erosion depth, indicating their clear limitations and the necessity of accurate data to apply the method. The methodology used with the key incorporation of the manoeuvre simulator is revealed to be a very useful tool to study new manoeuvres (including the possibility to work with a single or a couple of tugboats during the docking and undocking manoeuvres) to prevent propeller scouring actions. Llull, A., Mujal-Colilles, A., Castells, M., Gironella, X., Martinez, F. J., Martin, A., Sanchez-arcilla, A. 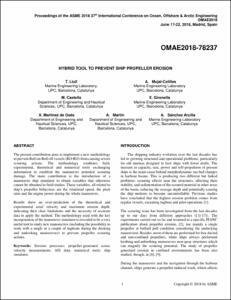 Hybrid tool to prevent ship propeller erosion. A: International Conference on Ocean, Offshore and Arctic Engineering. "Proceedings of the ASME 2018 37th International Conference on Ocean, Offshore and Arctic Engineering OMAE2018: June 17-22, 2018, Madrid, Spain". American Society of Mechanical Engineers (ASME), 2018, p. 1-9.